Robert Manekin is proud that he has been an influential leader during his 40-year career in commercial real estate. Manekin says projects he led in Frederick County, for example, were highly regarded in the community as they added jobs and increased the tax base. In addition, he says, educational programs he launched have increased the skills of real estate professionals. 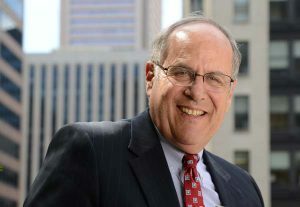 “There is no one more knowledgeable about the commercial real estate market in the Baltimore metropolitan area than Bob Manekin,” says Benjamin Rosenberg, founder and chairman of Rosenberg Martin Greenberg LLP. “While maintaining his production at Top Achiever levels, it is training the next generation of JLL’s brokers that now gets Bob’s attention and time,” Levy says. Manekin, who earned his law degree in 1973 from the University of Maryland Francis King Carey School of Law and has been senior vice president at JLL since January 2016, teaches the next generation of business leaders that what worked for him could work for them.